Do you need to have your teeth shifted? Modern dental orthodontics available at Brightleaf Dental offer a number of different techniques which help to position your teeth in a more normal and natural looking position. You need to arrange a consultation to allow Dr. Brightleaf to assess your requirements and discuss with you what your best options might be. For many teenagers and adults with minor to moderate bite problems or teeth spacing issues, Invisalign offers an effective and comfortable alternative to traditional metal braces. With nearly invisible Bioliners, you can get results without the hassle of metal brackets. Similar to Invisalign, Bioliners gradually straighten teeth with clear aligners and a more affordable price tag. That means no clunky wires and uncomfortable tightening sessions. Even better, the Bioliners clear plastic aligners are removable, so you don’t have to worry about giving up the foods you love. Treatment generally involves several rounds of Bioliners followed by the use of the Bioliner Plus for an additional week or two. Overall treatment time varies by individual, but Bioliners typically achieve the desired results in less time than traditional metal braces. Advances in modern dentistry have opened the doors to a variety of options when it comes to braces. Cosmetically pleasing braces have replaced the bulky ugly braces and headgear of the past. Ceramic braces have clear or tooth colored brackets and are less noticeable than traditional metal brackets. Although a bit more expensive than metal braces, they work well to straighten teeth. Invisible braces suit adults quite well as they are just as the name implies, virtually invisible. Removable trays are utilized with this method to straighten your teeth. You will need a new set of trays every two weeks as your teeth move into position. One advantage of invisible braces is that the removable trays allow you to eat without concerning yourself with breaking a wire or bracket. Metal braces rank at the top of most dentists list of tooth straightening options. Gone are the large metal brackets of yesterday. Rather than wrap completely around the tooth, the smaller brackets of today adhere to the front, reducing the bulk of braces. Many adults prefer braces on the backs of teeth, called lingual braces, simply for cosmetic reasons. Brackets and wires placed on the backsides of your teeth cannot be seen unless you open your mouth and tilt your head back. Lingual braces have their own set of pitfalls, as they can be difficult to brush properly and hard for your dentist to adjust. Invisalign, bioliners or traditional or modern braces can all be discussed after a careful examination of your teeth at Brightleaf Dental. The options can be compared according to budget and effectiveness and you can then decide which technique is best for you. If you have crooked teeth and have been intrigued by the idea of invisible braces, there are a few things you should know before you call the dentist. Invisalign aligners are generally called invisible braces, but they are not actually braces and offer many advantages in addition to being clear. Invisalign is a brand name for a type of orthodontic product that straightens teeth. 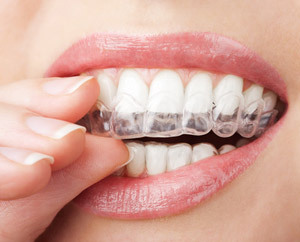 The aligners are clear plastic trays that are shaped to fit over your teeth. You wear them all the time except when you are eating or brushing your teeth; generally about 22 hours a day is recommended. You clean your Invisalign trays by simply rinsing then in warm tap water or with an Invisalign cleaning kit. Each set of trays is designed to be worn for two weeks. By switching to a new set every two weeks during your treatment, you always have fresh aligners that continue to move your teeth into proper position. For most adults, the entire treatment time is about one year. For teenagers it’s usually a bit longer. The cost of Invisalign is generally more than braces, but not as much more as many people expect. The cost depends on where you live and how serious your dental misalignment is. Insurance often covers at least part of Invisalign treatment. Invisalign is not for children. Invisalign Teen is suitable for teens who have lost all their baby teeth. Serious bite issues may require braces. Invisalign is great for moving teeth horizontally, but if you have an overbite or other serious bite issue, your dentist may recommend braces. You may need a retainer after Invisalign treatment. The good news is that Invisalign makes a clear retainer that may be suitable. Your dentist will determine if you need a retainer and which type will work for you if you do. there is no need to adjust to eating or brushing your teeth with them because they are removable. you see your dentist for checkups about every six weeks during treatment, which is much less often than the number of visits required for people who wear braces. Is Invisalign for you? Find out. If you’re interested in finding out if Invisalign is right for you, don’t wait another minute! Take advantage of our complimentary consultation.